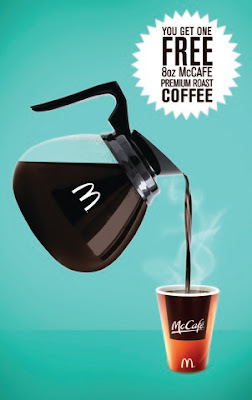 From August 8 to 12, 2011, experience the goodness of McCafe Premium Roast Coffee for free, just by simply presenting your FREE COFFEE coupon from 4:00 to 10:30 am at all McDonald’s breakfast stores nationwide. Watch out as these free coupons will be given away in offices, transportation terminals, colleges, universities and McDonald’s stores starting August 5. 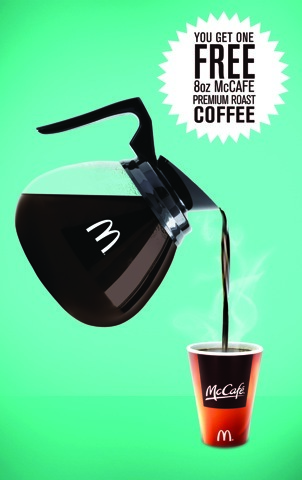 McCafe Premium Roast Coffee is made from 100% pure Arabica beans. Handpicked from some of the world’s best coffee-producing regions, McCafe Premium Roast Coffee is roasted and blended to perfection for that flavorful aroma and great-tasting brew. Have your free McCafe Premium Roast Coffee any way you want - coupons can be redeemed through dine-in, take-out or even drive-thru. Free coffee coupons can also be found in Manila Bulletin dated August 7, 2011 (Sunday) and in Philippine Daily Inquirer dated August 8, 2011 (Monday). For complete mechanics and details, visit the McDonald’s Facebook fan page.